AQHA Racing Champion Moonin The Eagle will stand the 2019 season at Hart Farms near Kaplan, Louisiana. 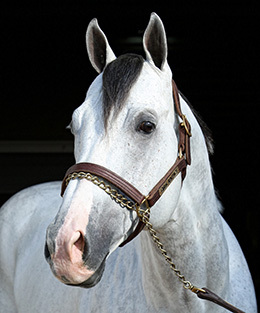 KAPLAN, LA—NOVEMBER 9, 2018—The long-anticipated sale of champion aged stallion Moonin The Eagle SI 111 happened last weekend when Chad Hart bid $2.1 million, a Quarter Horse race-bred stallion at auction world-record price, at Heritage Place to purchase the son of leading sire One Famous Eagle for Bobby D. Cox. The young stallion will stand the 2019 season at Hart Farms for a fee of $5,000. "As you can imagine, this is an exciting time for all of us to be connected to this special horse," Chad Hart said Thursday. "We believe strongly in Moonin The Eagle as a stallion, and we look forward to supporting him at Hart Farms." 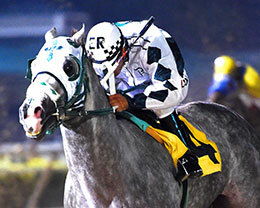 Campaigned by Gregorio Garza and trained by Rolando Almanza, Moonin The Eagle, left an indelible mark on racing while winning or placing in 10 of 14 career starts and banking $548,985. Named the 2016 AQHA Racing Champion Aged Stallion, he won the Grade 1 Remington Park Invitational Championship(G1), Hialeah Maturity, South Florida Derby, and Sam Abbey Memorial Invitational. He was second in Grade 1 Refrigerator Handicap and Hialeah Derby and a finalist in Rainbow Derby(G1), and Sam Houston Derby(G3). He broke his own 440 yard track record at Hialeah Park in :20.808 seconds and set a new 440 yard track record at Remington Park in the Remington Park Championship(G1), recording an amazing :20.808 seconds, earning a 111 speed index. "Moonin The Eagle was truly an exceptional racehorse," Hart said. "There are not too many horses to run 440 yards at Remington Park under 21 seconds." His sire, the AQHA Racing Champion 3-year-old colt One Famous Eagle SI 101 ($1,387,453) won the Los Alamitos Two Million Futurity(G1) and Los Alamitos Super Derby(G1). From only seven crops to race he is already among the industry's leading sires. He broke First Down Dash's first-crop earnings record in his freshman crop and has sired 23 stakes horses (21%), earners of more than $26.4 million with average earnings per starter of over $44,500. 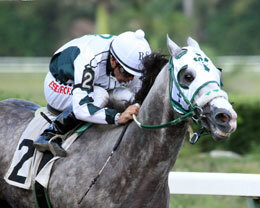 Moonin The Eagle was undefeated in 3 stakes starts at 4 to be named the AQHA Racing Champion Aged Stallion. One Famous Eagle's top performers include world champion – All American Futurity(G1) winner One Dashing Eagle SI 98 ($2,089,065), two-time champion- All American Futurity winner Imperial Eagle SI 106 ($1,868,151), All American Futurity(G1) winner Fly Baby Fly SI 96 ($1,813,957 to 3, 2018), All American Derby(G1) winner Hotstepper SI 98 ($1,097,261 to 3, 2018), to name a few. Moonin The Eagle's dam is the AQHA Racing Champion 2-Year-Old and Champion 2-Year-Old Filly Your First Moon SI 96 (7 wins, $750,726), by all-time leading sire First Down Dash. She won the Los Alamitos Million Futurity(G1) and Governor's Cup Futurity(G1). An AQHA "Dam of Distinction", Your First Moon has produced 11 ROM, 10 winners, 2 champions, 6 black type including four-time champion Moonist SI 101 (24 wins, $878,468), champion Moonin The Eagle SI 111 (see above), Grade 3 winner and multiple stakes sire Jess My Moon SI 99 ($78,450), Grade 3 winner Stray Cat SI 93 ($58,638), G1-placed All American Futurity(G1) runner-up The Marfa Lights SI 92 ($566,493), stakes-placed Im Leonidas SI 93 ($23,963), etc. The second dam is the *Beduino (TB) mare Moon Arisen SI 91, a grade 1 finalist half-sister to Grade 3 winner Totally Done Gone SI 101 ($116,695). She is the dam of 17 ROM, 15 winners, 5 black type including champion Your First Moon SI 95 (see above), Grade 1 winner Not A Full Moon SI 103 ($271,962), G1-placed Sunset Dash SI 102 ($250,795), stakes-placed Got No Secrets SI 82 ($9,585), etc. Moonin The Eagles first foals will be yearlings of 2019. For additional information or breeding contracts, call Chad Hart or Jerome Bellard, Hart Farms manager, at 337-643-3255.